The SwiftColor SCC-4000D Oversized Credential printer features single pass print-head technology and prints in beautiful 1200 dpi. The SCC4000D is highlighted by its blazing fast print speed, printing a 3.5” x 5.5” full color card in 2 seconds! It is a perfect fit printing oversize badges for tradeshows, large events, concerts, music festivals, racing, golf, major sports and stadium special events, parking passes, door hangers, tradeshows, media credentials, college/university, educational summits and seminars, and more. 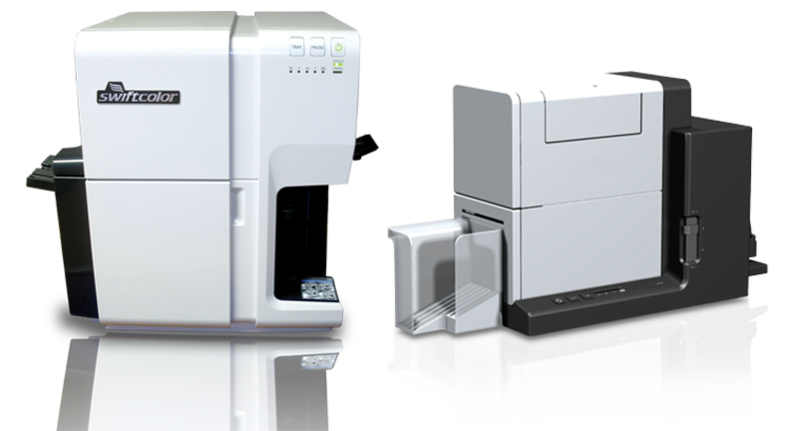 In a markets that require printing on-demand, high speed, and high quality – this is the perfect printer for you! Fast speed! Prints 3.5” x 5.5 in under 2 seconds! Prints on SwiftColor paper or PVC cards. Prints sizes 3.5”x5.5”, CR100, 3.5” x 4”, 4”x6”, and more! SwiftColor has proprietary paper and PVC cards! These cards are unique because there is a special ink receptive layer, the cards have been tested and pair with single pass print head technology for a perfect print! We also offer additional security features such as UV hot stamp, UHF, and hologram as special order. Other custom sizes are available. CR100, 3.5”x4”, 4”x6” and more! Glossy and matte finishes available. Additional added security features such as UV hot stamp, UHF, and hologram.